Promoting peace and tolerance means NOT taking a picture in front of your Osama target. As you know, Osama Bin Laden was the representation of peace and tolerance, except for all those innocents he ordered to be murdered. Good thing a Calgary Muslim leader can speak up against an outrageous Osama zombie target in defense of Bin Laden. Yeah, hatred of terrorists. Not sure why that’s a bad thing. CALGARY – A Calgary Muslim leader says a photograph showing MP Rob Anders and federal candidate Melissa Mathieson at a firing range in front of a target depicting a lifelike image of a terrorist promotes hatred. But not everyone says the photo, which has been circulating on social media, poses a real problem. The image has sparked debate about what lifelike figures are appropriate targets for firing ranges and whether there is a line, however narrow, that should not be crossed. The photo shows Anders, the MP for Calgary West, and Mathieson, who is vying for the federal Conservative nomination in the upcoming Macleod byelection, standing back-to-back with guns in their hands at a Calgary shooting range last weekend. Behind them is a target depicting a caricature of a bearded Muslim man wearing a turban and torn clothes, with an assault rifle in his hands. 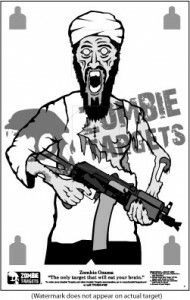 A website that sells the same target,: ZombieTargets.net,: identifies the character as a zombie Osama bin Laden. “As leaders, they should promote tolerance and show the real image of Canada, a peaceful place where people come to enjoy freedom of speech and religion, and not being judged because of somebody else’s actions,” Merhi said. To be fair I don’t really see other zombie targets of other peaceful leaders like Che Guevarra or Hitler. This is definitely an issue worthy of all our attention.